Isn't Albany a city in New York? It is! In 1916 (after thirty years of existence) the city of New Decatur renamed itself after the capital of New York state. Why was New Decatur renamed? The city was renamed to ease rivalries between Old and New Decatur. It must have worked—in 1927, just over ten years later, the two cities merged. To live in Albany is to live in a place where people care about their neighbors, whether that neighbor is the family next door, the shop on the corner, or the church down the street! 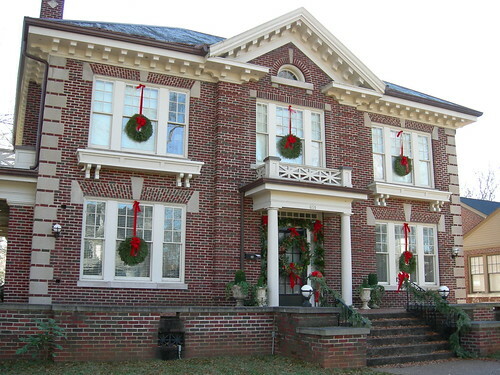 One of two historic neighborhoods in Decatur, Alabama, Albany extends from its own downtown district centered on Second Avenue to the beautiful and historic Delano Park (named after Sara Delano Roosevelt, mother of Franklin Delano Roosevelt). On January 11, 1887, the Decatur Land Improvement and Furnace Company, Inc., was formed under the leadership of E.C. Gordon, C.C. Harris, and W.W. Littlejohn. With a capital investment of $7,500,00, the company purchased 5,600 acres of land, including 100 acres set aside for churches and schools. 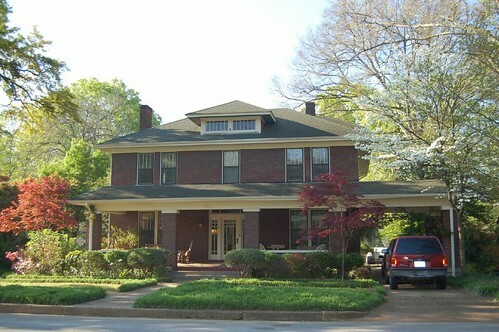 "New Decatur," as the city was named, was advertised as the "Gateway City," with well-planned streets and improvements. Forty-one new industries and five hundred structures were built in 1887. To alleviate northern/southern rivalries, streets bore the names of four Civil War Generals, two Union (Grant and Sherman) and two Confederate (Johnston and Jackson). The State Legislature confirmed the New Decatur charter on February 18, 1889, and the future looked bright for the city its founders had hoped would grow into the "Chicago of the South" at the confluence of the river and the railroad. Advertising across the midwest to draw industry, the Decatur Land Improvement and Furnace Company touted their "modern community" designed by one of America's premier landscape architects, Nathan Franklin Barrett. Delano Park's natural curves and open green spaces were designed by Barrett in accordance with the ideas of the City Beautiful movement, which held that beautiful and pleasant spaces positively influenced those who lived in and around them. The park's unusual shape was designed to break up the grid of the city and relieve the stress of urban life. The DLIF's plans for New Decatur weren't only about external beauty, however: after a devastating yellow fever outbreak in 1878, one of the major draws to New Decatur was to be its modern water systems, thought to guard against the disease (the perceived importance of this system is still apparent in the prominent placement of the neighborhood's water tower at one end of Delano Park). To that end, they hired the "father of public works," E.G. Waring, architect of the drainage system for New York's Central Park, and promoted New Decatur as "the healthiest city in the South." At the time of New Decatur's charter in 1889, however, the area had suffered another yellow fever outbreak, and was particularly vulnerable when financial prospects soured between 1892 and 1894. The initial heady days of booming construction and enterprise did not return, but a steady recovery ensued. By the early 1900's the two Decaturs had become a major metropolitan area in Alabama, with a population between 7,000 and 8,000. At this time, many new homes were constructed and civic improvements were made as the city focused on providing a superior quality of life for its citizens. In 1919 a livery stable on Second Avenue in Albany was renovated to become the Princess Theater and in 1929 (two years after Albany merged with Old Decatur to form one city) Decatur's first traffic lights were installed. Downtown was the place to be on weekend evenings, with movies, ice cream parlors, and live theater and musical performances all providing a social outlet. In 1983 with the leadership of retired Judge David Breland, Albany was nominated and accepted for a listing on the National Register of Historic Places. See documentation survey ( Part 1, Part 2, Part 3, Part 4, Part 5) and photos. 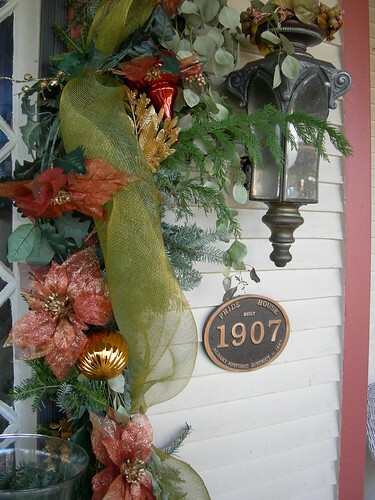 Though Albany was begun in 1887, its buildings are not only Victorian—houses in the neighborhood represent many styles, the majority from the 1880s through the 1940s. This is the quintessential "Victorian" house, the most elaborate of any Victorian style, with gingerbread work and elaborate woodwork both outside and inside. It is nonsymmetrical, loaded with gables, dormers, chimneys, towers, etc. and so completely dominated Victorian residential architecture that it is now more or less synonymous with the typical image of Victorian architecture. The style can be found both as large homes and small cottages. Following on the heels of America's Centennial celebrations, the Colonial Revival emerged in the early 1880s. 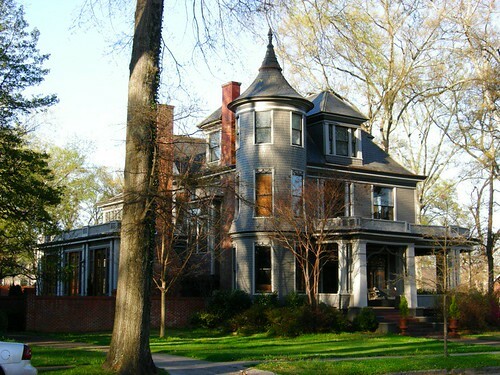 The style, which borrowed heavily from early American architecture - particularly Georgian style buildings - was largely an outgrowth of a new pride in America's past and a rapidly growing interest in historic preservation. The Colonial Revival building is often a combination of various Colonial styles and elements contemporary to the time of construction. Generally the Revival house is larger than its Colonial counterpart and some of the individual elements are exaggerated or out of proportion with other parts of the house. Some Revival houses, however, are executed with such historical accuracy that they are difficult to distinguish from original houses. The American Foursquare is known by a variety of terms including box house, a cube, a double cube or a square type American house. 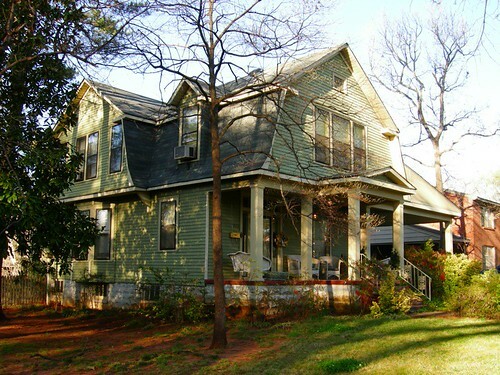 It first appeared on the housing scene around 1890 and remained popular well into the 1930s. A reaction to the ornate and mass produced elements of the Victorian and other Revival styles popular throughout the last half of the 19th century, the American Foursquare was plain, often incorporating handcrafted "honest" woodwork (unless purchased from a mail-order catalogue). 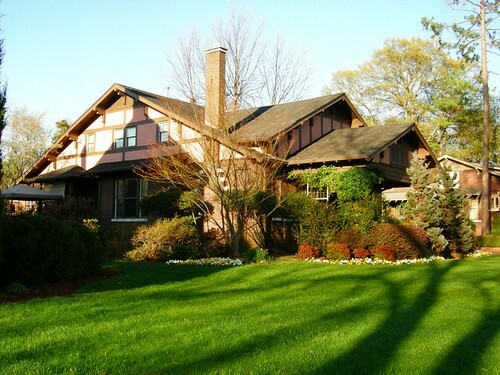 This style incorporates elements of the Prairie School and the Craftsman styles. It is also sometimes called Transitional Pyramid. This American style originated in homes built by German settlers in Pennsylvania as early as the 1600s. A hallmark of the style is a broad gambrel roof with flaring eaves that extend over the porches, creating a barn-like effect. The style enjoyed a revival during the first three decades of the 20th century as the country looked back with nostalgia to its colonial past. In the mid-19th century, many prosperous Americans believed that ancient Greece represented the spirit of democracy. Interest in British styles had waned during the bitter War of 1812, and many Americans sympathized with Greece's own struggles for independence in the 1820s. 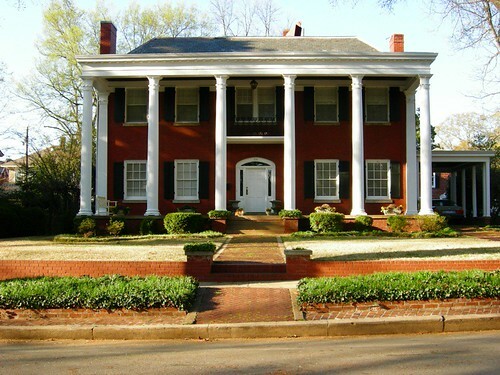 The style is an adaptation of the classic Greek temple front employing details of Doric, Ionic or Corinthian order, and features porticos (either entry or full-width) supported by prominent square or rounded columns, decorative cornices, larger-than-usual windows and doors, and a front door surrounded by narrow sidelights and a rectangular line of transom lights above. 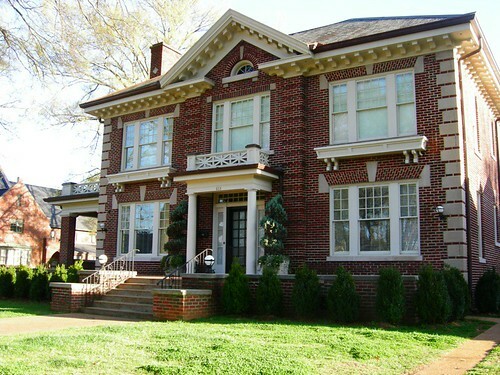 Though the national passion for the style had passed by the time Albany was built, several houses in the neighborhood are built in the style. The word "bungalow" is derived from bangla or bangala, used in the province of Bengal in India to describe a cool, thatched roof dwelling. British colonists adapted these structures as summer homes in which the interior was arranged around central living rooms. This design became the prototype for America's Craftsman Bungalows, where it signified a look that was simple, basic and antithetical to the flowery excesses of Victorian architecture. You will find listed here the officers of the Albany Historic District, the organization that runs our neighborhood. Inquiries should be directed to the President, though new neighbors should also get in touch with their Street Alderman.